The bamboo calligraphy pen is one of the oldest tools of calligraphy in the world. More than a millennium ago, Arabic calligraphers found bamboo to be the ideal tool for a wide variety of calligraphic works, both large- and small-scale. This tradition began in Iraq, but later spread to the rest of the Islamic world. Bamboo's hard edge allows the calligrapher to perform the full spectrum of pen movements, but bamboo also has a suppleness and flexibility that is crucial for Arabic and Islamic calligraphy. Our bamboo is the flat-sided species of bamboo preferred by calligraphers for generations. This species is both entirely different from the standard full-round bamboo and not available for sale here in America. We import it specifically for calligraphy. We also offer two sets of Bamboo pen in a decorative gold-speckled boxed set. 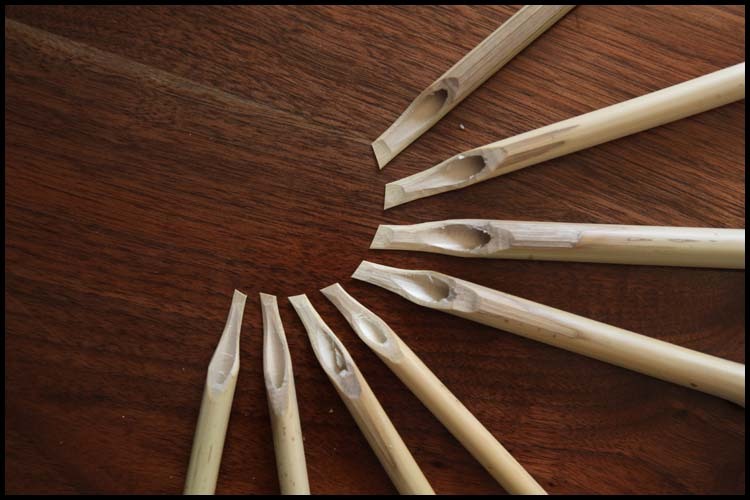 To view a video of the Bamboo pen writing, click the link below.